In the Coors Molson Handicap (3.40) at Salisbury on Wednesday, Mr Top Hat has yet to win beyond 6 furlongs, but both his pedigree and style of racing suggest that stepping up to a mile won’t do him any harm. On his most recent outing, over the testing 7 furlongs at Sandown, he led at a good pace and, although readily held by the winner, Rum Runner, he kept on well to finish second, beaten 1¼ lengths. 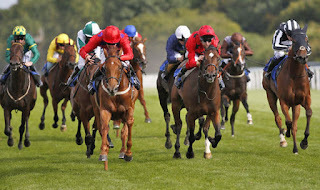 His previous form, over 6 furlongs at Leicester – another testing track – has worked out well, with the winner, Gabrial The Saint, far from disgraced in a hot 0-105 handicap at York and the second and fourth, Elnadim Star and Airshow, winning next time. David Evans’ three-year-old steps back up to 0-100 level off a handicap mark 1lb higher than at Sandown but, while his sole win came on heavy going here last October, he appears fully effective on the prevailing good to firm going, so he must have a decent chance of regaining the winning thread. Jockey Fran Berry has a fair, if unspectacular, 11-52 (21%) strike rate on three-year-olds for the yard over the last five seasons, for a healthy level stakes profit of 25.25 points. Hopefully, the Kildarian can steer Mr Top Hat to a second course win.